A few years ago, Target started selling classic board games in cool wooden box sets made to look like books. 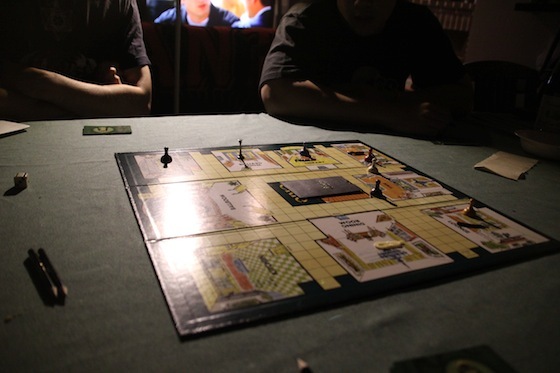 We bought several when they were on sale, and one of them was “Clue” – I remember one girl I knew in high school loved to play it with her family, my brother Jim thinks it’s a great game, and it seemed fun … but I had actually never played it myself before. Well, Ryan’s up this weekend (they’re going bouldering again tomorrow! ), so we thought this would be a fun time to finally play the game since you need a minimum of three players (and Ryan hadn’t played it either!). 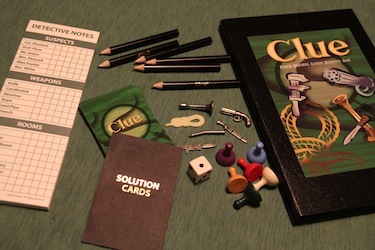 Here’s what’s in the box – the playing board, player pieces, weapon pieces, detective note sheets, pencils, a “solution cards” envelope, and a deck of suspect, weapon, and room cards. Each suspect/player piece has a specific start point on the board. You determine who uses which piece simply by picking whichever player piece is closest to you when you sit down to play. The weapons are placed in different rooms, and the board is set. You separate the cards into “suspect”, “weapon”, and “room” piles, and choose a card, without looking at it, from each deck. These three cards are the solution to the murder mystery! These cards are placed into the “solution cards” envelope and placed in the center of the board. The rest of the cards get shuffled and dealt to each player. Everyone checks off the cards in their hand on their detective sheet, so they can easily see on the sheet that none of those cards are in the solution. “Ms. Scarlet” always goes first, and then gameplay moves around the board to the left. You roll the die, and move the appropriate amount of spaces. What you want to do is get into different rooms in the mansion so you can make “suggestions” about who may have committed the murder, with what weapon, in the room you’ve just landed in. When you make a suggestion, the other players, starting with the person on your left, tell you whether or not they can disprove your theory (meaning they hold a card that corresponds to your guess, meaning that card is not in the “solution” envelope. If they do hold a card you’ve guessed, they show it to you without anyone else looking at it, and you’ve eliminated that card as part of the solution. 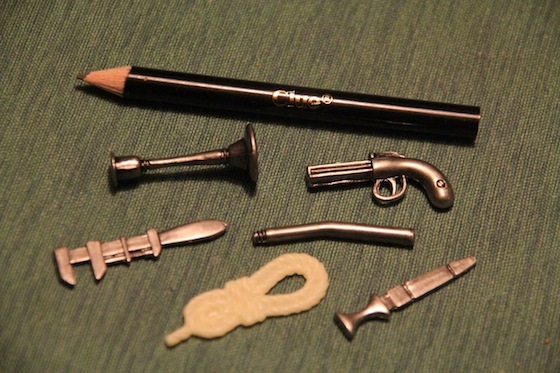 By process of elimination, you try to be the first one to figure out who the murder was, what weapon they used, and in what room the crime was committed. It was super hot today, so we had the living room and dining room lights off, and used a stand lamp for our light. It gave a more ominous feel to our game play, don’t you think? This game is super fun. There are a lot of different strategies you can use to try to figure certain things out – but there is also an element of luck in the way information is revealed. I won the first round, so of course I loved the game from the get go – but it really is fun. 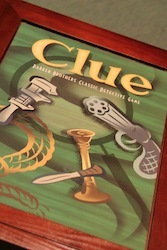 If you haven’t played “Clue” yet, you really should! Come on over and we can all play!